Diarrheal diseases inflict substantial mortality and morbidity in young children worldwide. The human gut microbiota has proved to be essential in understanding our health and diseases, but its structure and dynamic under the impact of diarrhea remains unexplored. In this study, we set out to characterize the gut microbiota succession over the duration of diarrhea. We included over 200 stool samples from 90 Vietnamese children with diarrhea, which were sampled longitudinally (day 1, 7, and 15). Total DNA from the stool samples were extracted and subjected to 16S rRNA gene profiling using Illumina sequencing. We found that the gut microbiota structure was significantly different between the early and recovery phases of diarrhea. Particularly, the acute phase was dominated by Streptococcus and Escherichia, while other gut commensals such as Bacteroides, Eubacterium, Lachnospiraceae, and Clostridium were significantly depleted. During 15 days of study, the gut microbiota recovered to resemble those of the healthy gut, and this occurred concurrently with gradual elevation of alpha diversity. Using a combination of statistical tests and machine learning approaches, we showed that Acidaminococcus sp., Butyricicoccus pullicaecorum, and Bifidobacterium bifidum exhibited negative associations with diarrheal duration in this patient group. This indicates that these species may act as potential probiotic candidates for accelerating diarrhea recovery rate and restoration of the healthy gut microbiota. Overall, this study enhances our understanding on the dynamic of the gut microbiota under the perturbation of infectious diarrhea. 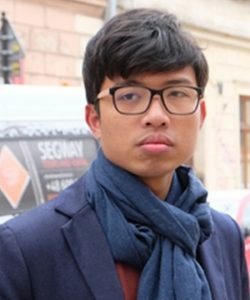 TRAN Tuan-Anh is a graduate from the Erasmus Joint Master Program on Molecular Nano- and Biophotonics. He has conducted research for five years and published several scientific papers in bioinformatics. He is currently interested in applying machine learning to computational chemistry and biology.